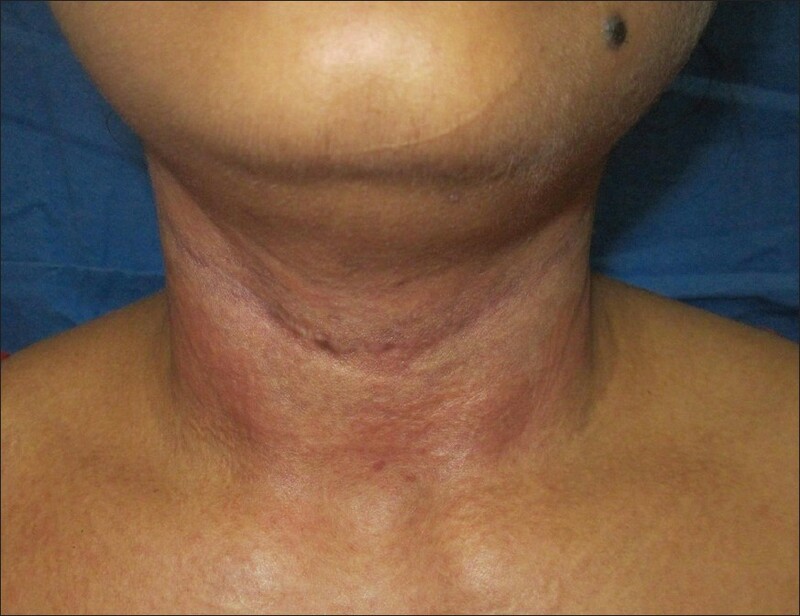 A 23-year-old unmarried female presented with hyperpigmentation and increased skin folds on her neck since 7 years. There were no similar lesions at other sites, including axillae, groins, or abdomen. The lesions started at puberty and gradually became more numerous and prominent. No progressive dimness of vision or hypertension was present. There was no similar history in family members. Dermatological examinations revealed lax skin and multiple yellowish colored papules, which coalesced to give a 'plucked chicken skin' appearance [Figure 1]. No other sites were involved. 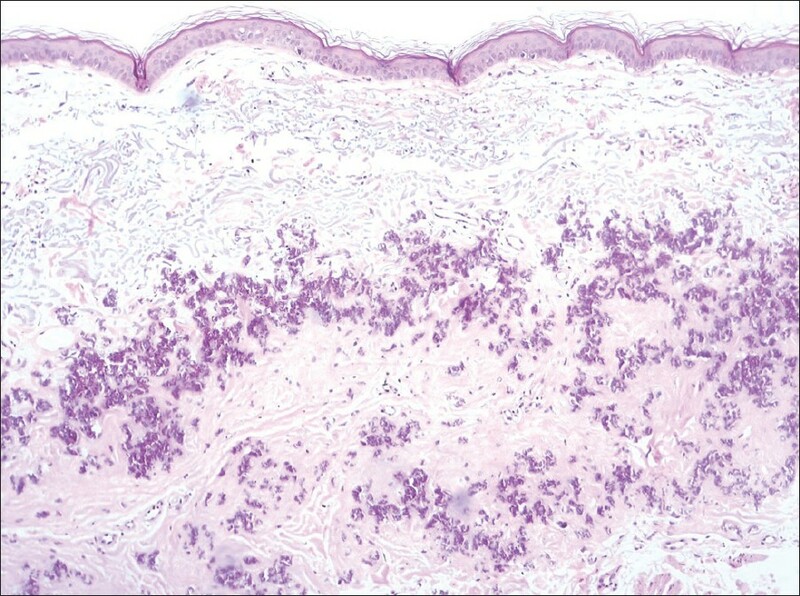 Skin biopsy of samples from the neck revealed fragmentation and calcification of the connective tissue fibers in the middle and lower third of the dermis, with H and E stain [Figure 2]. Von-Verhoeff-Van Gieson stain confirmed the diagnosis. No angioid streaks of the retina were seen. Gastroenteroscopy, 2D echo and chest X-ray revealed no abnormality. In view of the clinical manifestations and pathological findings, a final diagnosis of pseudoxanthoma elasticum was made. Various surgical options were considered such as a pre auricular incision and neck lift but it was felt that it would fail to give cosmetically favorable results; SMAS plication and submental platysmaplasty was deemed not necessary as the main problem was skin laxity; hence, cervical rhytidectomy was planned. A 12-cm strip of skin was excised along the skin folds. 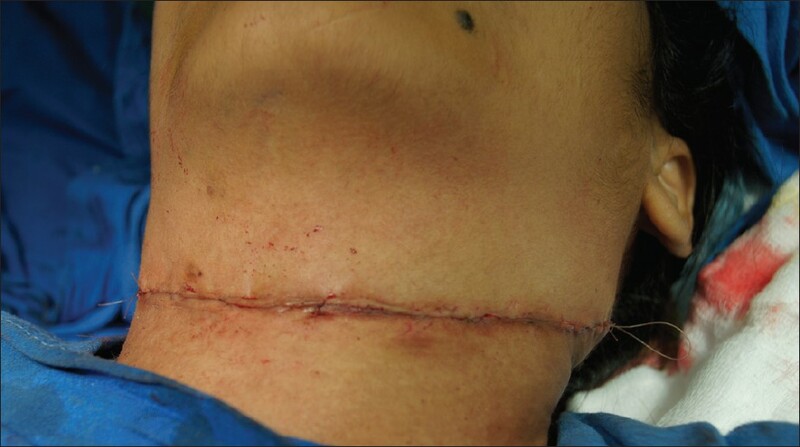 Closure was done with 3-0 vicryl rapid with subcuticular sutures [Figure 3]. No post operative complications were seen on follow up. At 8 months follow-up post-operatively, a decrease in skin laxity and wrinkling was seen [Figure 4]. The patient is now on regular follow-up and very satisfied with the post-operative results. We report this case to highlight the benefits of surgical correction in psuedoxanthoma patients for achieving a cosmetically acceptable result. 1. Ng ABY, O'Sullivan ST, Sharpe DT. Plastic surgery and pseudoxanthoma elasticum. Br J Plast Surg 1999;52:594-6. 2. Neldner KH. Pseudoxanthoma elasticum. Clin Dermatol 1988;6:1-159. 3. Uitto J, Shamban A. Heritable skin diseases with molecular defects in collagen or elastin. Dermatol Clin 1987;5:63-84. 4. Viljoen DL, Bloch C, Beighton P. Plastic surgery in pseudoxanthoma elasticum: Experience in nine patients. Plast Reconstr Surg 1990;85:233-8.